Whilst producing the Mark I Turn Indicator I decided on a nice simple approach covering just the five main phases of each turn. I had thought to spilt each phase into individual steps but decided against it because the full turn sequence is much too long to fit on the dial. From a design viewpoint, the only workable option is to select the main steps in each phase. Unfortunately, I don’t have enough experience just yet to select the right steps. All this changed yesterday. 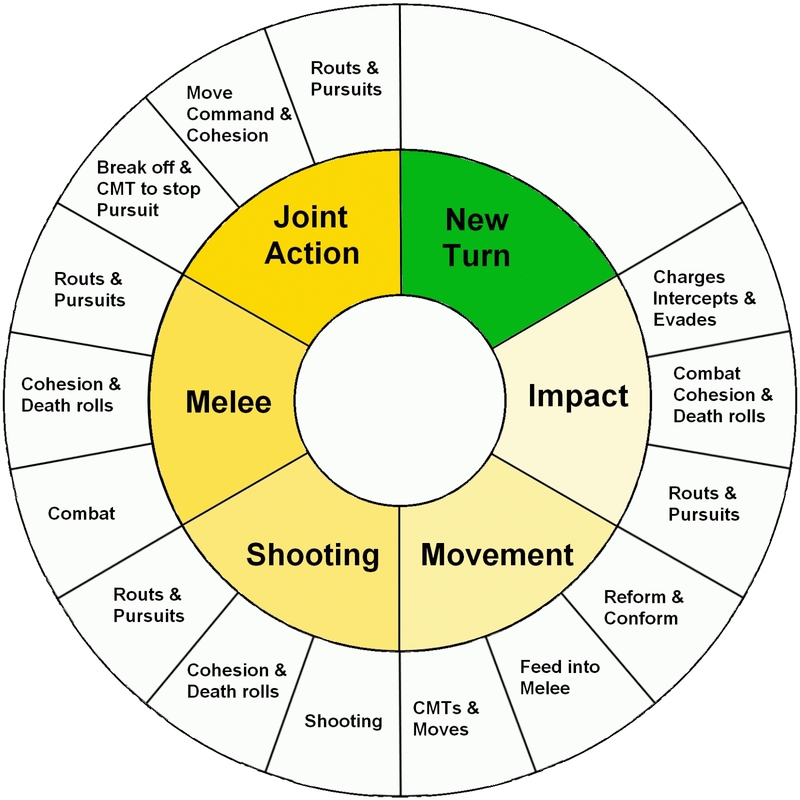 I was searching for a printable full turn sequence when I stumbled across a play sheet in the German section of the Field of Glory website. This gave a much reduced and “basic” turn sequence. After some messing about with the original design I had the Mark II dial shown right. We’ll try the Mark II indicator on Sunday and report back. After I posted a link on the FOG Yahoo! group I’ve had some quick feedback. The design now includes “routs & pursuits” in the shooting and melee phases. After seeing this post Karsten Loh has kindly uploaded a printable version of the full turn sequence for us all to use. Thanks Karsten. We use this guide all the time in our club. Especially useful in a tournament when I wear down and forget. Thanks! Glad you found it useful. I too find the FOG sequence of play getting more onerous towards the end of games.